After 8 months of secrecy and making moves behind the curtain, we’re finally ready to tell the world what Tinsel is building. I was so nervous to share the idea with people when we first started last fall -- the wearables space is so competitive and fast-paced. But now, after all this tight-lipped silence, I’m ready to scream it running down the streets of San Francisco! Okay, :::deep breath:::, let's get on with it. For our first product, Tinsel is creating a necklace. But not just ANY necklace. 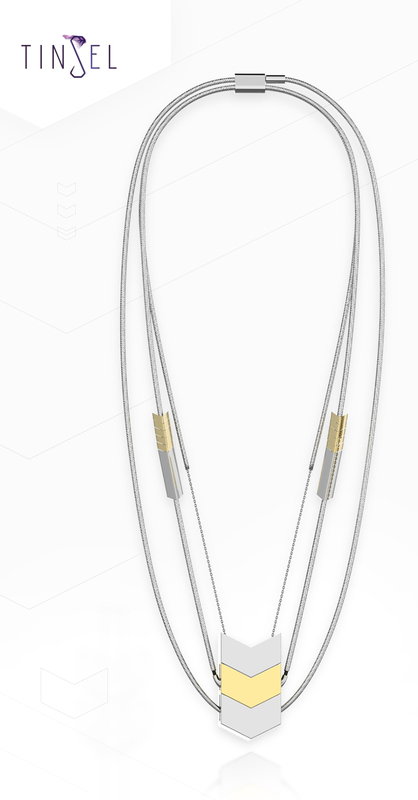 THIS necklace will have the complete functionality of headphones built into it, without compromising a woman’s style. Headphones, particularly earbuds, have become an essential for many people, myself included, and probably even you reading this. I mean, it’s not a water/food/shelter essential, but I feel incredibly inconvenienced when I don’t have them. I’m using them to take phone calls and listen to music virtually every day. But, I have a love-hate relationship with my earbuds. I rarely have pockets to shove them into, so they get shoved into my purse, which is a bottomless pit of wallet, keys, lip gloss, and business cards that I have to wade through to find the earbuds. Then, when I finally feel a wire down there, I pull them out and spend the next 3 minutes untangling them. Ugh, so frustrating! Not to mention the wear-and-tear that happens from them living in my black hole of a handbag, the annoyance of me leaving them at home, losing them, or my husband taking them thinking they’re his. I wanted to find a way to wear my earbuds on my body all day long, but without them looking like earbuds. I spend too much time standing in front of my closet each morning choosing an outfit, only to have it downgraded by plastic-coated wires. Enter Tinsel. 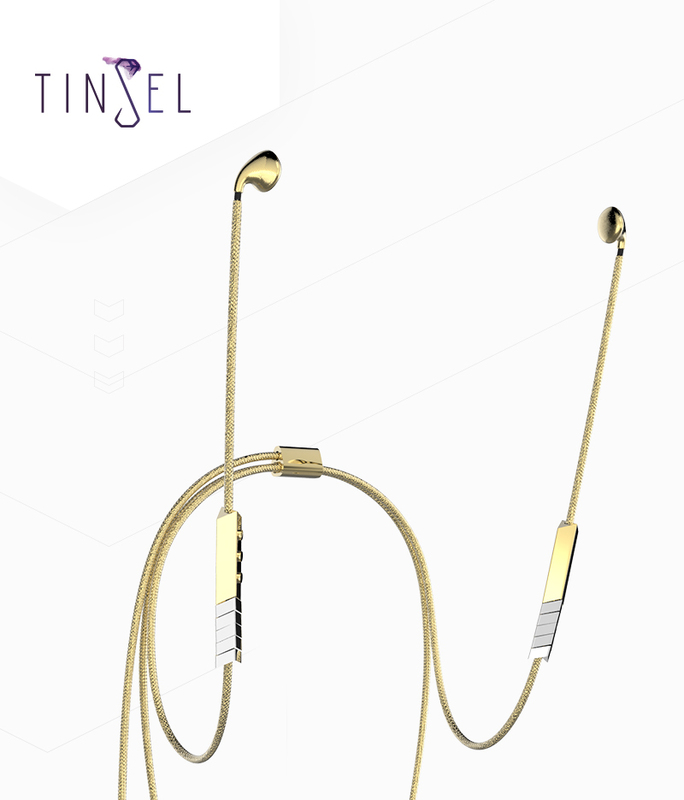 Ladies, if you love fashion, accessories and your headphones, then Tinsel is for you. We want to make it possible for women to enjoy technology without sacrificing their style. This necklace is something that no one would be able to tell is anything other than a necklace until you use it for its other purpose. What woman doesn't like to have a little secret up her sleeve? Tinsel is your new best kept secret. This necklace will be be made with the care and consideration that you deserve, a luxury item crafted from quality materials that you can easily mix in with your wardrobe and other accessories. To the world you’ll be wearing a beautiful jewelry piece, but you know it’s more than that, because the functionality built into it makes your life easier.